Claude Diebolt, Founder, Publication Director and Managing Editor. Dora Costa and Michael Haupert, Co-editors. Paul David, Richard Easterlin, Stanley Engerman, Robert Fogel†, Claudia Goldin, John Komlos, Peter Temin, Jean-Claude Toutain, Jeffrey Williamson. Jörg Baten, Elise Brezis, Stephen Broadberry, Nicholas Crafts, Lee Craig, David de la Croix, Olivier Darné, Alexander Field, Price Fishback, Caroline Fohlin, James Foreman-Peck, Simon Johnson, Rainer Metz, Tapas Mishra, Kris Mitchener, Kim Oosterlinck, Leandro Prados de la Escosura, Thomas Rahlf, Max-Stephan Schulze, Paul Sharp, Gerald Silverberg, Solomos Solomou, Mark Spoerer, Richard Steckel, Jochen Streb, Hans-Joachim Voth, Marc Weidenmier, Jacob Weisdorf, Eugene White, Nikolaus Wolf. Cliometrica provides a leading forum for exchange of ideas and research in all facets, in all historical periods and in all geographical locations of historical economics. 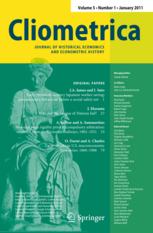 The journal encourages the methodological debate, the use of economic theory in general and model building in particular, the reliance upon quantification to buttress the models with historical data, the use of the more standard historical knowledge to broaden the understanding and suggesting new avenues of research, and the use of statistical theory and econometrics to combine models with data in a single consistent explanation. The highest standards of quality are promoted. All articles will be subject to Cliometrica's peer review process. On occasion, specialised topics may be presented in a special issue.